When Ilona Bourdon arrived in the United States, she expected to experience the average American teenage life, not walk through a house of blood and terror. Bourdon and 39 other students from Annecy, France, came to West Bend on October 11 as part of the West Bend and Annecy Student Exchange. Every other year the French students visit West Bend for two weeks to experience American culture and American teenage life. The students and three teachers each stayed with a host, went to West Bend High School, went on fieldtrips—including a day trip to Chicago—and joined in on activities planned by the hosting students. In France, Halloween is not very popular; few kids dress up and go trick-or-treating. 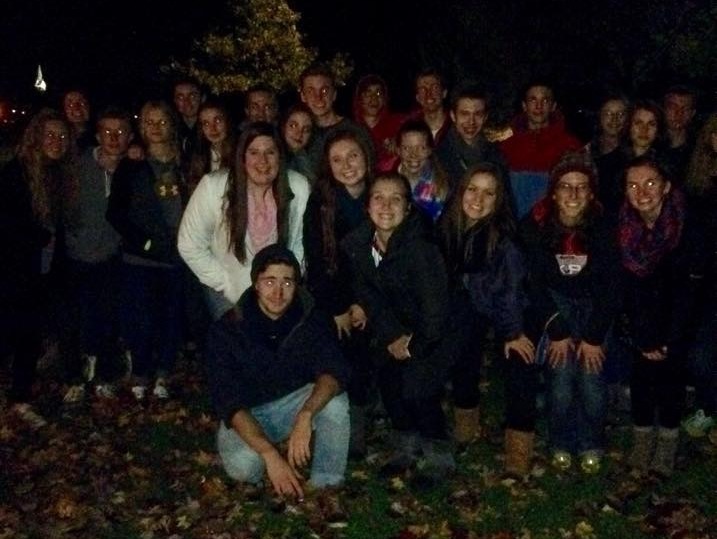 Haunted houses are not run in France, so one activity on the list for the French exchange students was the Jaycees Haunted House in Hartford, Wisconsin. Many of the French students were nervous while waiting in a tent prior to entering the house. The ladies working in the tent shouted out all the rules and assured the French students that if they stayed with their group they would not be used as props for next year. Unfortunately, the ladies at the tent may have been too scary for some, because their fears got to them. French student Lucille De Villa did not want to enter the house because she was too afraid, and another French student, Léa Igier, made her way through the woods but ended up turning around before entering the house. “I am so nervous,” Bourdon repeated before going into the house. Bourdon is a very sweet and quiet girl, so many of her group members were nervous for her and her friend, Melody Chanal. The two girls clung onto each other while Suzy Schober, a West senior, reminded them the whole house was fake and filled with actors. “I thought she was crying the whole time,” Schober said about Bourdon’s reaction in the haunted house. Bourdon ended up having a great experience, though. “It was scary, but it was fun,” she said. “The kids take the French students to a haunted house every year,” Fischer said. In past years, the group made their way down to Six Flags for Fright Fest, but according to Fischer haunted houses became more convenient for everyone. A little bit of a cultural difference was experienced by the French students when it came to carving pumpkins. However, the French students greatly enjoyed carving pumpkins and many students did a great job considering it was their first time doing it. For the most part, the events planned were normal occurrences for American teenagers, such as going to the mall with friends, attending high school sporting events, and simply hanging out with friends to watch movies or play Just Dance on the Xbox. At the end of the French students’ visit everyone involved in the exchange had enjoyed themselves and had made many new friendships and memories. For West Bend students, it was exciting to see the French students who went through the haunted house and carve pumpkins have a good time experiencing Halloween in America. Quel bon article! Merci Alex de l’avoir écrit. On va te faire peur dans les catacombes de Paris!